Dating back to 1910 when the Hotel McLaren was constructed, this building in the downtown area in the City of Winnipeg, Manitoba was owned by a prominent Winnipeg family who owned various other hoteling establishments. Today, the Hotel McLaren still stands and to beautify the building somewhat, a colorful wall mural was done on the side wall. The only difference in the accommodations in this building is that it is now home to long term residents instead of short term guests. 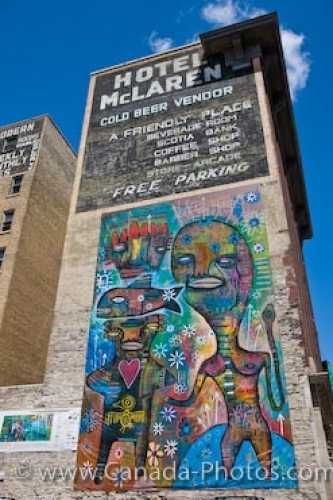 Picture of a colorful wall mural on a downtown building in the City of Winnipeg, Manitoba. ... Once a very impressive building, the McLaren Hotel now shows its age and as well as being living quarters for many, it is also a local place for beer sales with the new addition of a sushi restaurant. Wall mural on the side of a building in the City of Winnipeg, Manitoba, Canada.